For this I stamped it with my Versamark Onyx Black ink and then colored with my copic markers. I kinda see now in looking at it I might of colored the arm in blue like the robe LOL! Didn't notice that before! Anyway...after I colored it and cut it out with my CutterBee scissors I used some 3D Crystal Lacquer to make it glossy looking. 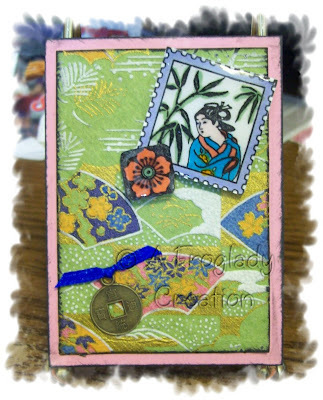 I edged my the Asian paper with my Onyx inkpad and then mounted it onto pink card stock from The Paper Place, Wellington OH that was also edged with the Onyx ink. Then I found a little doo-dad in my embelly tray, tied a bit of blue ribbon on it and used mini glue dots to affix it to the top.